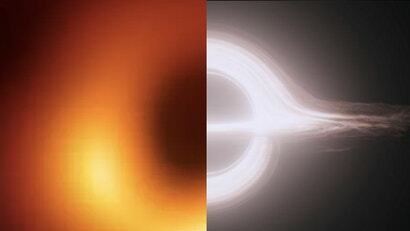 Black holes are long-time superstars of science fiction. But their Hollywood fame is a little strange given that no-one has ever actually seen one – at least, until now. Last week, scientists turned Earth into one giant telescope to capture the uncapturable. The result was the first ever photo of a black hole. It's a landmark image for a multitude of reasons - including the credence it gives to Einstein’s theory of relativity. If you needed to see to believe, then thank the Event Horizon Telescope (EHT), which has just produced the first ever direct image of a black hole. This amazing feat required global collaboration to turn the Earth into one giant telescope and image an object thousands of trillions of kilometres away. There is a mistake in this article. Sagittarius A* is the name of the super massive black hole at the center of the milky way. The two closest super massive black holes are Sagittarius A* and the super massive black hole in the Andromeda Galaxy, which is our closest neighbor. The black hole that was imaged is located in the M87 galaxy. There is no such thing as black holes Einstein is not right it's a plasmoid. Birkland currents and plasma Electricity rule the universe the old dogmatic standard model is dying bye bye grsvitically nebular solar formations of a nuclear sun. Ha the sum is electric. Not gas. The only thing that's gas is the standard model light on the subject. Thunderbolts of the gods. And safire project is proof. What a steaming load of ignorant uneducated crap. .. reading that destroyed precious brain cells. Extraordinary claims require extraordinary evidence and yours is seriously lacking. Drunken dreams and falling down does not the facts provide. General Relativity continues to be confirmed. The 1st sentence are inacurate, they never turned earth into one giant telescope just last week, they worked it for years, what they did is anounced the output of the entire process.